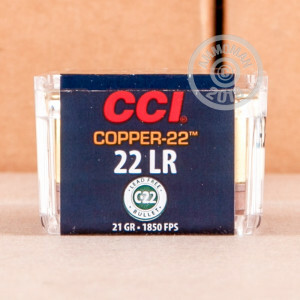 This 22 LR cartridge from CCI’s Copper-22 line of ammunition features a projectile made of compressed copper and polymer. It’s not only suitable for hunting in California where you’d rather not engage in expensive lines of conversation with the authorities, but also areas which you’d personally rather remain unadulterated by lead. 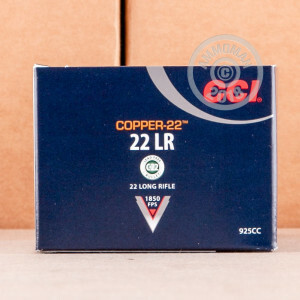 This round’s bullet is also exceedingly light -- only 21 grains, nearly half its caliber’s original bullet weight. That gives it a high muzzle velocity and accordingly superior accuracy, so you can peg even the craftiest critters with ease. Furthermore, because it’s a hollow point this bullet will expand to cause greater damage during penetration. 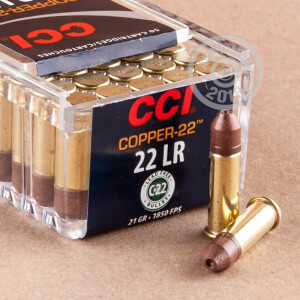 CCI is well-known for their high quality rimfire primed ammunition. This round honors that reputation with its smooth cycling brass casing and clean burning propellant. Its primer is non-corrosive as well, making it gentle on your firearm and able to sit in its plastic box until the day it’s ready to go.